1)Had my internship for 22weeks, preparing myself to face the society soon. Learn a lot of related knowledge and received my first angpau in Singapore Dollar during Chinese New Year. 3)Being inspired by Boon Ming during internship period, I start to blog more often and installed Nuffnang, hoping to earn some side income. Apparently, I failed....earned a total of $38.36 by 28th Dec 2009, can't even cash out. 4)Felt and fear the side effect of gambling, where I can lost few hundreds in one night at the casino when I can't even earn that amount back through my part time job. 5)Earn more and spend more in Singapore without worrying much about the currency exchange rate. Instead of multiplying 2.5x for everything that I purchased in Singapore to convert it into Ringgit Malaysia, I divided 2.5x the cost of the items that I found in Malaysia to convert it into Singapore Dollar. 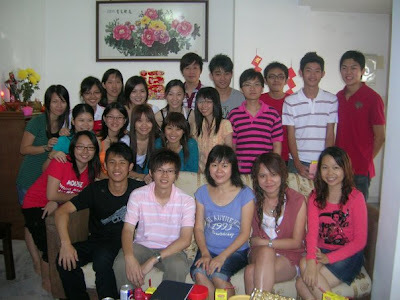 6)Took a plane since 1997 and travelled to Hong Kong with 2 of my uni mates for 7 days. It's a wonderful place and I wish to revisit the place again. 7)A meaningful and happening holidays for me, went Redang with The Tigers after we have been planning it since 3 years ago. 9)During one of the sleepless nights, inspiration and ideas cross over my mind when I am planning on my last performance in NTU. Acted as Encik Najis in the skid "Jutawan Kampung", based on the story of "Slumdog Millionaire"
11)Won myself a Nike bag worth SG$50, the grand prize in a lucky draw event for the 1st time in my life. 12)After 22 years, that's the first time I think that I am fat when I weigh more than 60kg. My father told me that I will look exactly like him 30 years later. 2009 is a good year to me. Thanks to everyone who helped me through out this year, I appreciate it and wish you all have a good year ahead. Ehh...my nuffnang is only RM 10.95 and i installed it two years ago. lagi pathetic.